Use the Atlas of Worlds to guide your travels as you delve deeper into Path of Exile's map system. As you explore the Atlas, you'll gain the ability to upgrade maps and even add mods to the Atlas itself. Fight your way through over a dozen new boss encounters to face the four Guardians of the Void and earn your right to challenge the Shaper himself. Path of Exile's largest ever update in terms of new areas to explore, Atlas of Worlds increases the pool of end-game maps available by almost 50%. Featuring dozens of new Unique Items (many of which are designed by Path of Exile's community) and many entirely new base item types, Atlas of Worlds contains powerful items for players to find. 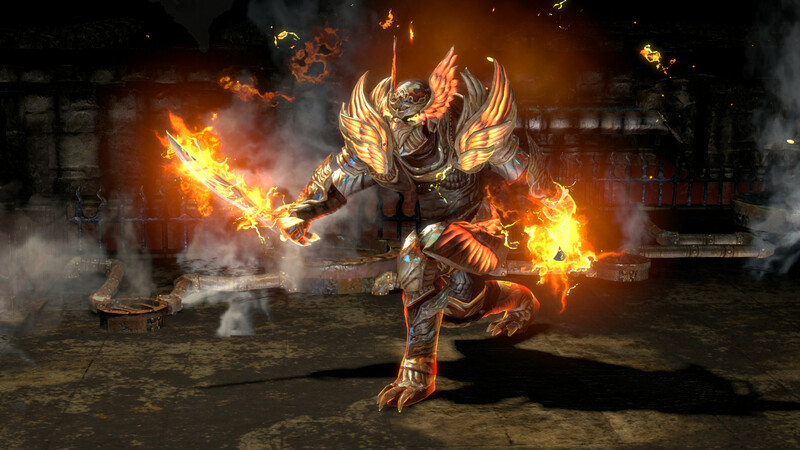 We've multi-threaded Path of Exile's game engine to take full advantage of modern CPUs. This results in up to double the previous frame rate during intense combat situations. The Atlas of Worlds expansion has the best game performance of any Path of Exile release yet. We're also launching a new set of Supporter Packs alongside Atlas of Worlds. They feature the four exclusive armour sets worn by the Guardians of the Void, as well as new weapon effects, forum titles, portrait frames, t-shirts and Atlas of Worlds microfibre cloth maps. Thanks for your generous support! The launch of Atlas of Worlds also marks the start of our latest three-month challenge league: Essence. Encounter groups of monsters trapped by an ancient force, break them out to steal their Essence then use these to craft powerful items. There are 25 different types of Essence with up to seven power levels each, creating deadly encounters with tantalising rewards.